Today I could buy a Corsair 16GB Flash Voyager for $36 ($2.25/GB). My point is that the price for USB thumb drives constantly falls and the capacity constantly rises. The largest size commonly sold in Australian stores at the moment is 32GB starting at around $70. 64GB, 128Gb are also available at a much smaller number of stores but are understandably much more expensive eg: $550 for a 128 GB drive! I don’t think 64GB, 128GB, 256GB+ capacity USB 2.0 flash drives are going to be useful because they are limited by USB 2.0’s transfer speeds. A 32GB Transcend Jetflash V60 drive filled with JPEG photo files connected to a Dell Studio 17 laptop took 22min 43.2 seconds to copy the photos onto the laptops hard disk. Because the write speed is half as fast it would take roughly 47minutes to fill the drive with photos copied from the laptop. I estimate that even if a 256GB USB drive can be as fast as the Transcend drive I tested it would take 352 minutes (5 hours 52minutes) to fill it with files and 176minutes (2 hours 56minutes) to copy the files back to a hard disk drive. This shows the limitation of the USB 2.0 connection used by USB flash drives. 32GB+ capacity USB flash drives won’t be useful in real life until the widespread implementation of USB 3.0 which is supposed to be 10 times faster than USB 2.0 and can upload and download simultaneously (USB 2.0 can only do one or the other). If you have a look at the top of this article you’ll see that there’s a big range in how large drives are, the smallest drive is both thinner and much shorter than the largest. 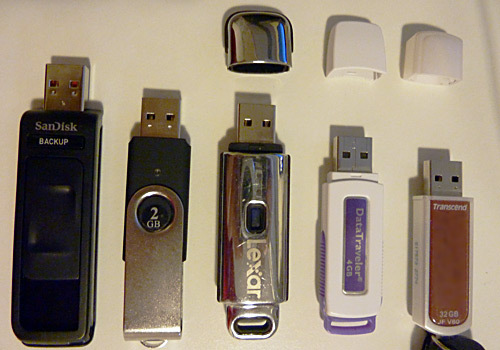 Most USB thumb drives are made from plastic so they are cheap, light and usually small. Unfortunately this means they are much more likely to break if dropped, stepped or sat on. Some USB flash drives have an all metal case like the Lexar Jumpdrive or a mostly metal case like the Sandisk Cruzer Contour. They’re much more likely to survive being scratched by car keys, dropped, sat on etc but are heavier and fatter than the plastic drives so they make it hard to plug other devices into adjacent USB slots. Generally speaking USB Flash Thumb Drives have a limited number of write/delete cycles. The more heavily you use them to transfer many files/often the faster they will fail. For 99% of people this isn’t relevant because a drive will likely be discarded and replaced long before it wears out. However I strongly advise against using cheap no name USB flash drives sold on Ebay and computer markets or given away at a conference. These are cheap/free for a reason – it’s because they’re made from low quality parts and are much more likely to fail. I do some casual work at University of Technology Sydney (UTS) and the flash drives I’ve seen students using which fail and cause them to lose whole assignments are almost always cheap no-name drives. USB Drives with a detachable cap are useless, sooner or later you will lose the cap. Drives with swivel cap protection for the USB connection can be found every now and then (see 2nd drive from the left in photo at top of article). The benefit with these is they can be much smaller. USB Drives with retractable USB connections are becoming more popular because they don’t need a cap. However this brings up other issues because the retractable slider switches are not always designed well and can get stuck. If you like to hang your USB drive around your neck make sure it has a Lanyard loop and it’s big enough to attach your preferred lanyard. The speed it’s something that people overlook when they choose their pen but, like ram memories usb pen’s also have different speed that can make a huge difference. I definately agree that the implementation of USB3 will increase the effectiveness of higher capacity drives. We’re seeing it now. Many of the new systems are coming with USB3 and SATA drives are up to 6 GB/s transfer. I’m estimating that within the next 3 years we’ll be seeing TB transfer speeds.